driving to a client’s home, but what if you want a multi-service mobile spa? We spoke to women who made the plunge to find out how they got started. Reason for going mobile: Simonides became concerned about job security when she realized computers were taking over parts of her job. “I started to consider a career change and I tried to think of a way to make money doing what I love so it wouldn’t feel like work,” says Simonides. “I had loved art in school, but I knew I couldn’t go back that far. Then I thought of how much I love going into the salon. I always leave there feeling great. I wanted to make people feel like that.” Simonides went to school, earned her license, and began working. One day she asked another tech how long it took to build a clientele. “When she said five years, I decided I didn’t have time to wait for clients to come to me; I’d go to them,” she says. How it works: Simonides knew other mobile services were available, but no salon traveled as a self-contained business.” With some planning, investment, and hard work, Simonides opened her self-contained mobile spa. On the Go Spa is a 30-foot mobile home that has been converted into a salon with a nail table and stylist chair, plus an area for massage, waxing, and facials. Simonides works with corporations to schedule days where On the Go Spa rolls into the parking lot so employees can enjoy salon services on their breaks. “The corporations love it because it doesn’t cost them anything to bring me in, and they can tout it as a service they offer their ­employees,” she says. Simonides hires sub-contractors to avoid the hassle of employees, but she reverses the paradigm. “I give them the larger percentage because my overhead is low,” she says. Sub-contractors bring their own supplies when they come to work, or, in some cases, they store their own product on board. Simonides finds people to work with her both through her contacts from working in a salon and by word of mouth. She works mainly with three sub-contractors, scheduling events from 11 a.m. to 2 p.m. when employees can take a break from work. “Each service is about 30 minutes, so we usually book six appointments per service provider,” explains Simonides. Most subcontractors work with her three hours a day, three days a week, plus do hair or nails outside of their work with On the Go Spa. Find out about franchise opportunities at www.onthegospa.com. Spa Events NY, Rochester, N.Y.
Reason for going mobile: “After nail school, I worked in high-end and fast-paced salons, but found my true passion was bringing high-quality salon and spa treatments to individuals and organizations so they can be pampered at their location,” says Perez. 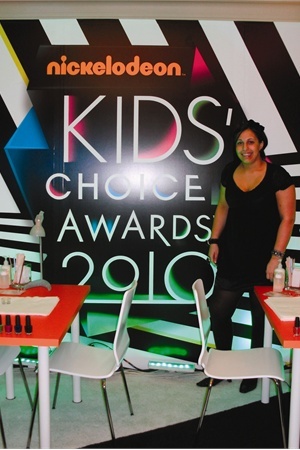 “With a nail salon on every corner, I wanted to do something different, so I decided to start a mobile spa company dedicated to children and moms.” Perez says after five years her business has grown to include men, women, corporate events, fundraisers, and even marketing events. “We now contract with 15 beauty professionals, and I’m always finding myself at a party,” she says. How it works: Her average residential party is five to 10 guests, and the average corporate event is anywhere from 10 to 50+. She requires the final head count two weeks in advance so she can schedule an adequate amount of staff. “We figure out how many staff members we will need to service our guests within the three- to four-hour timeframe of our events,” she explains. Perez is able to find great techs by networking and staying involved in the industry. Because most of the events take place on weekends, most of her independent contractors have full-time jobs in salons. However, some work solely with Perez, which gives them time with their children and family during the week. Perez supplies not only the linens and spa robes, she also provides nearly all the service supplies in order to maintain consistency between techs. However, for specialty hair services or makeup, independent contractors bring their own products. Reason for going mobile: While working in the salon, Fitts wanted to be able to provide services to people who weren’t able to get to the salon: expectant mothers, people who had surgery, business travelers, etc. 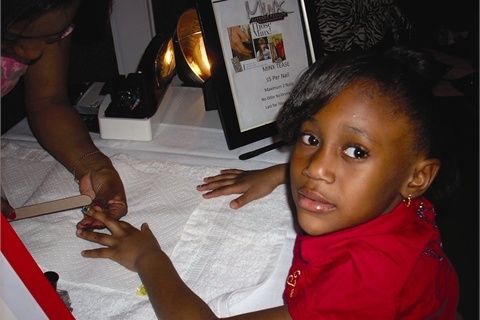 Plus, she wanted a way to educate little girls about nail care. What better way than a Little Ms. Priss Party? Now, about 25% of her business comes from one-on-one services. 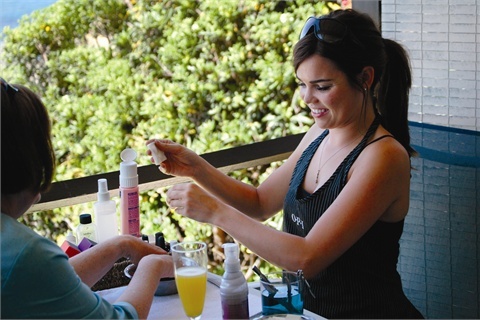 Bridal and spa parties account for about 35% of bookings, and nearly 40% of her business is from corporate events. How it works: To book a party, a client contacts Fitts and they discuss services, rates, travel fees, and expectations. Fitts uses PayPal to generate an invoice, confirm scheduled appointments, and produce a contract including a list of services and terms and conditions. Once the client pays through PayPal, a confirmation e-mail is sent. Though payments are non-refundable, “Clients can reschedule and use funds toward services or gift certificates,” says Fitts. It’s relatively easy to find independent contractors for the parties because of the relationships Fitts has with other techs, and because of the reputation she has built through Manicures-n-Motion. “I am very specific when I call a tech for a job,” says Fitts. She lets techs know exactly what she expects and what the job pays. “Plus, I pay them right after the event, so they aren’t waiting for their money,” she says. 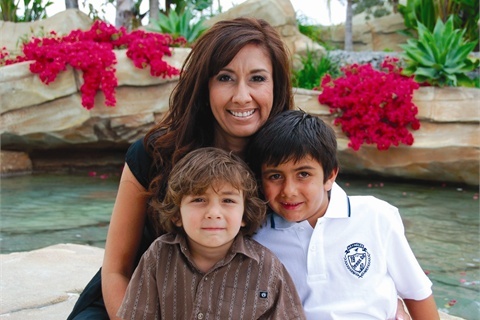 The Pampered Self, Rancho Santa Margarita, Calif.
Reason for going mobile: “I had so many gift certificates to the spa, and I had trouble finding time to use them because I was a stay-at-home mom with young children,” says Tena. When the cards began to pile up, her husband suggested she ask the technicians to come to the house. Tena looked into it and realized there was a void in the market. “I realized many women were in my position, and I decided to start a business to bring spa services to clients,” she says. 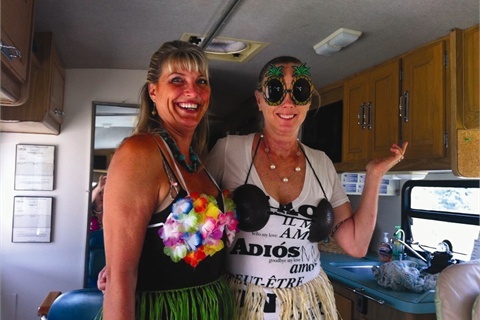 Tena was familiar with the responsibilities of an entrepreneur, because she had helped run her mother-in-law’s business, so she took the plunge and opened the first mobile spa in Orange County. 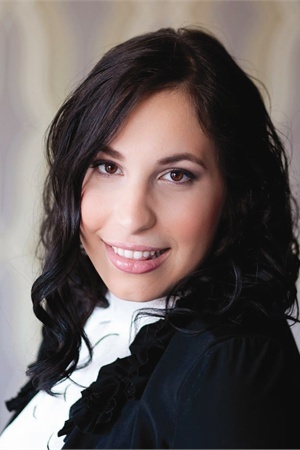 How it works: “I couldn’t provide services myself, because I’m not licensed,” explains Tena. “But very early on, I met a woman who did nails and hair, and she loved my idea. She talked to her friends, and they talked to their friends, and that’s how I built my network of techs.” Tena has about 35 people total who she can call, but she relies predominantly on about 12. Tena is clear about what she offers her contracted workers. She doesn’t guarantee a certain amount of work; the work is completely on-call. “I sit down for an interview before they ever work for me and I let them know how percentages are split on each service, what our guidelines are, and what it means to me to deliver the best possible experience to our clients,” says Tena. “If we decide to work together, I have them sign a contract with a confidentiality agreement.” In addition, though Tena carries liability insurance on the company, she requires each contractor to carry personal insurance. When a client calls to book an event, Tena discusses how many services the hostess would like each guest to receive (usually two or three). Once that is decided, the hostess talks to her guests to see which individual services they want to book. One may pick a pedi with a facial; another may want a mani and pedi. All appointments take 30 minutes, so from a scheduling standpoint, all services are equal. “Everyone tells the hostess, and then she calls me to give me a final count on the number of guests, and who needs manis, pedis, etc.,” says Tena. No changes can be made within 48 hours of the party. Tena’s organizational and managerial skills play out well at this point. She creates a spreadsheet of how many people are attending the event and which services are needed. Then she creates a schedule of who will receive what service with which tech at what time. This way she knows how many techs she needs. If more people choose pedicures than facials, she knows she will need more nail techs and fewer estheticians. An average party runs three to four hours and has 15 to 20 guests. On the night of the party, Tena arrives early to prepare the ambiance of the room with linens and other spa-like touches. Tena supplies items necessary to the party itself, such as towels and robes, but techs bring the supplies they need to perform the service. Carolyn McNairn has been in the nail industry for 25 years. Ten years ago, she opened Mobile Beauty in Ottawa, Canada. She received so many calls asking her how she did it that she developed a guide on CD titled, “How to Start a Mobile Spa Business.” The guide includes marketing tips, information on finding and retaining the right people, and business tools, such as pricing structures. Find out more at www.mobilebeautysystems.com. 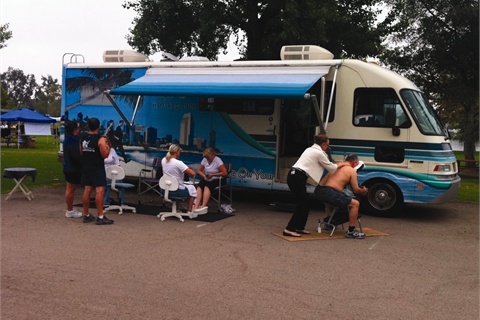 To see if mobile salons are permitted in your state, go to www.nailsmag.com/stateboards.